At Elevate at Red Rocks, you can make your home your own. You will find 9-foot ceilings in every one, two, and three bedroom apartment for rent, as well as vaulted ceilings in third-floor apartments. Wood-style flooring contributes to the inviting aesthetic inside your apartment. Thanks to your private patio or balcony, you can enjoy a cup of coffee each morning while taking in views of the surrounding community. If you are feeling active, you can take your coffee on the go for a walk through the landscape community grounds or to the nearby trails at Union Ridge Park. Whether you are searching for a one bedroom apartment for you and your pet, a two bedroom apartment to share with a roommate, or a three bedroom apartment for your whole family, you’ll find what you’re looking for at Elevate at Red Rocks. 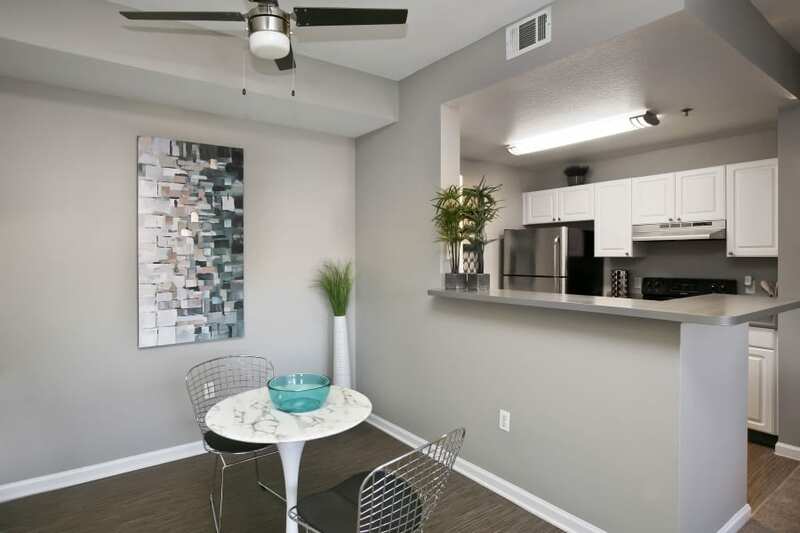 You can look forward to year-round comfort provided by the air conditioning and ceiling fans found in each of our apartments. The kitchen is fully equipped with all the appliances you need, including a dishwasher. You can even look forward to doing laundry right at home with the help of your in-home washer and dryer. Coming and going from the property is also made simple with onsite garage and carport parking options. Contact us today to take a look at our spacious one, two, and three bedroom floor plan options at Elevate at Red Rocks in Lakewood, CO.